Before delving into a discussion on glacial erosion, let us first briefly discuss what erosion is. 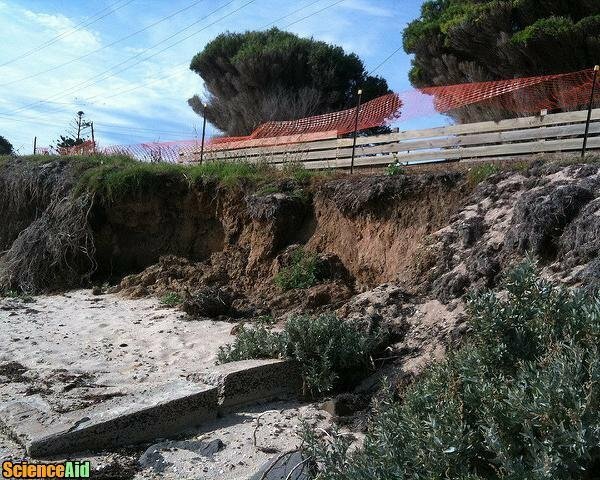 Erosion occurs when the earth's surface is deteriorated by forces such as water and wind. Imagine water running down a hill, dragging rocks with it, piling them at the bottom of the slope and leaving a scar on the earth's face -- this is erosion. Glaciers cause erosion, too. Glaciers are formed when ice and snow are packed tightly together over a substantial amount of surface land. These piles of compacted ice and snow will only form and grow under the proper conditions. Additionally, there are two types of glaciers. 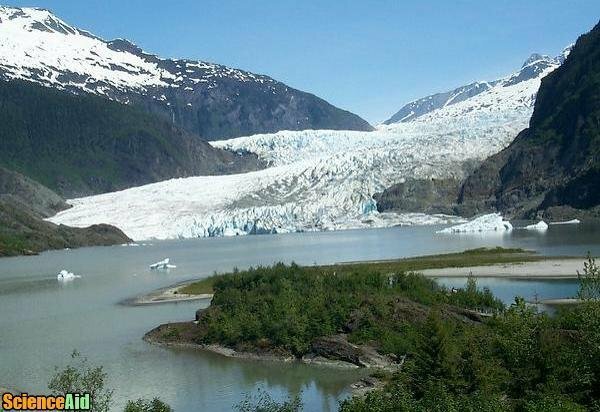 These glaciers cause two kinds of erosion, creating multiple types of glacial landforms. There are three components in the development of glaciers: temperature, location, and formation. 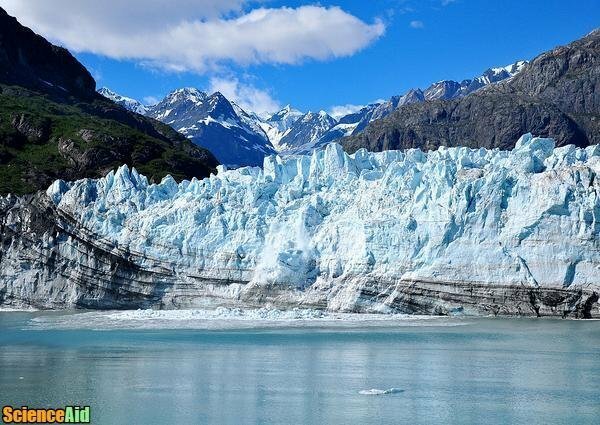 In order for a glacier to form, the temperature must be below freezing. Glaciers can only develop if the amount of snow that falls is greater than the amount of snow that melts. If this ratio is backward, glaciers will shrink rather than expand. Glaciers generally develop around the north and south poles. They can also form on mountains that are at high elevation. During the days when the temperature is warm, the snow will begin to melt. As the temperature falls, that thawing snow will freeze. In the proper environment, it will snow again -- these new flakes settling on the frozen ones. This new snow will also melt and freeze. This process becomes a cycle: snow, melt, freeze. As these layers of snow build up, they will grow heavy, and the constant thawing and freezing, as well as the weight, will turn the snow pile into an ice block. As the weight of all the layers pushes down, the glacier will start to spread out, and gravity will pull it downwards, causing the glacier to cover more and more land. This spreading out is the glacial ice moving. As snow persists to fall, glaciers will continue to grow and spread. The earth goes through cooling cycles, which means that for significant periods of time there will be more snow falling than melting. When the earth enters these cooling cycles, snow hits the ground faster than it can melt. This excessive snow and lack of melting causes glaciers to advance significantly, covering a lot of earth's surface in ice. Think of an ice age. There are two categories of glaciers: continental glaciers and valley glaciers. These glaciers are also referred to as ice sheets, and they develop in areas that have cold summers; that is, they form in polar climates (such as the Antarctic and Greenland). Continental glaciers develop on broad, flat land. 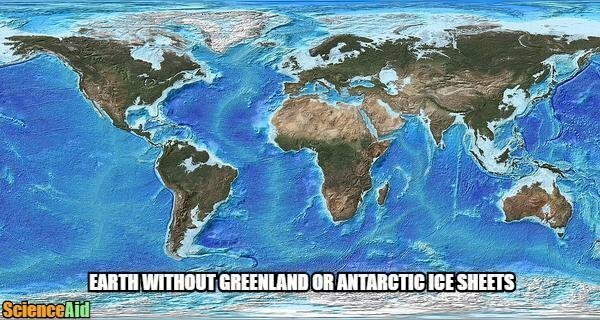 What is the difference between ice sheets and ice caps? Ice sheets blanket more than 50,000 square kilometers or about 20,000 square miles while ice caps cover less. These glaciers are also referred to as Alpine glaciers. While continental glaciers are wide, valley glaciers are thin and stretch over a long area of land. They begin at high elevations and then move down into mountain valleys -- hence their name. Plucking and abrasion are two types of glacial erosion. Glaciers continue to expand over the earth's surface, and as they do so, some ice melts below the glacier. As this ice thaws, the water will slip into fissures in the bedrock below the glacier. Exactly like the snow's cycle, this water will freeze and thaw, freeze and thaw, freeze and thaw. What this does is deteriorate (erode) the bedrock, making it so that pieces of rock become loose. As the glacier continues to expand, the loose rocks move with it, which displaces the rocks and robs that area of minerals it once had. As the rocks move with the glacier, the weight of the glacier pushes the rocks down hard into the ground and drags the rocks along. The glaciers forcing the rocks (and itself) against the ground and pulling them (and itself) across it leaves scars in the earth's surface. Glacial erosion leaves behind landforms -- "scars" (or more gently, markings) on the earth's surface. Arêtes are sharp crests or ridges of rock caused by glaciers that were close to each other. Cirques are circular, hollow basins that glaciers create in mountains. Horns or glacial horns are formed when more than two glaciers that are near each other erode a mountain, creating a peak (rather than an arête). Tarns are bodies of water, or mountain lakes, that gather and develop in cirques. Other landforms include the following: bergschrund, col, erratics, fjord, hanging valleys, paternoster lakes, rôche moutonnée, truncated spurs, and You and V shaped valleys. Fun fact: North America's five great lakes (Superior, Michigan, Huron, Erie, and Ontario) were created as a result of glacial erosion. 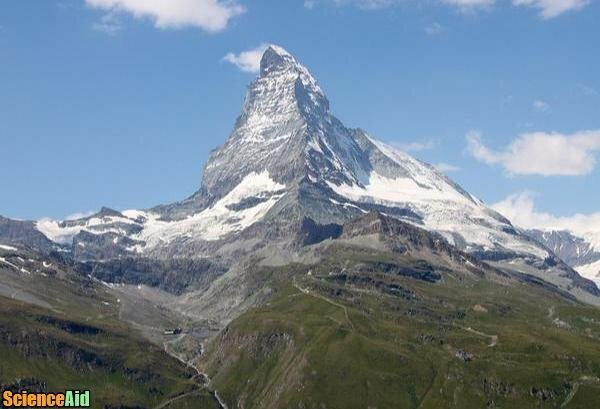 To understand how glacial erosion and climate change are affecting the earth, we need to take a look at how mountains are formed. Mountains are the result of tectonic plates crashing into each other. These collisions push the earth's surface upwards, creating large land masses that jut upwards. Glaciers, then, control mountains by eroding them away. Look at it this way: tectonic plates form mountains; glaciers help erode mountains. Because the climate is warming, University of Cincinnati geologist Eva Enkelmann  says glaciers are currently "wet-based," which means erosion is occurring faster. This erosion affects tectonic plates -- creating earthquakes and tsunamis. With climate change warming global weather, snow melts faster than it can settle on the earth's surface. In turn, glaciers melt. Glaciers shrinking increases the amount of water in the ocean and raises sea levels. Increased sea levels cause major problems for cities along coastlines as these cities will slowly be engulfed by the ocean. MLA (Modern Language Association) "Glacial Erosion." ScienceAid, scienceaid.net/Glacial_Erosion Accessed 20 Apr 2019. Chicago / Turabian ScienceAid.net. "Glacial Erosion." Accessed Apr 20, 2019. https://scienceaid.net/Glacial_Erosion. Thanks to all authors for creating a page that has been read 685 times.